In order to relieve the bank’s balance sheet of distressed loans, Hamburg Commercial Bank AG (formerly HSH Nordbank AG) economically transferred to portfoliomanagement a portfolio of non-performing shipping loans with effect from 1 July 2016. The original exposure at default (EaD) as at the reporting date of 31 December 2015 amounted to about five billion euros. After restructuring measures and adjustments to the portfolio, an EaD of about 4.1 billion euros was transferred. The purchase price amounted to about 2.4 billion euros, which was the value established by the European Commission as the maximum permissible purchase price under the state-aid scheme. The portfolio transferred (“Initial Portfolio”) consisted of 590 loan agreements with 193 borrowers. The funds had been used to finance 256 ships (as at the reference date of 31 December 2015) which serve as collateral. At the time of the transfer, 253 ships were transferred as collateral to portfoliomanagement. The three other ships were excluded from the portfolio due to sale or reclassification. About two thirds of the ships involved are container vessels, tankers and bulkers and to a smaller extent other types of ships. Due to the continual reduction of the portfolio, the number of ships in the portfolio is gradually declining. The overview below shows a classification of the Initial Portfolio. 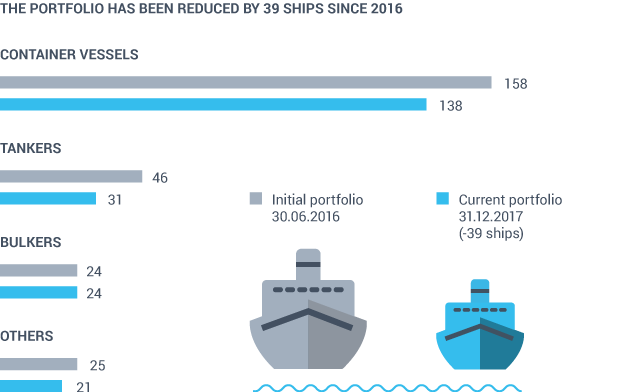 The vast majority of the portfolio’s ship collateral consists of 158 Container vessels making up 62 per cent of the portfolio, followed by 46 Tankers (18 per cent) and 24 Bulkers (10 per cent). Finally, the portfolio contains 25 MPP (multipurpose) and general cargo vessels representing 10 per cent of the collateral in the portfolio. The prices on the merchant shipping markets are principally determined by the relationship between the amount of available tonnage and demand for maritime transport capacity. The amount of available tonnage is calculated based on the size of the segment’s fleet. It increases when new ships are delivered and decreases when ships go out of service, usually as a result of scrapping or decommissioning. Demand is impacted by various factors depending on the market segment. In general, demand for maritime transport correlates strongly with trends in international trade, more than 80% of which is seaborn. Viewed as a whole, 2017 brought improvements for merchant shipping compared to the weak previous year, even though the markets continued to be characterized by overcapacity and fierce price-based and hostile competition. In 2017, maritime trade volumes grew by approximately 4.1%, expanding faster than global economic output (2017: approximately 3.6%) for the first time since 2012. While some areas of the container and bulk shipping segments recorded significant improvements in average charter rates and ship prices, charter rates in the tanker shipping sector in particular were significantly below the previous year’s level. The ClarkSea Index, which maps the development of charter rates in all major shipping markets, showed fluctuations in the first half of 2017 without significant outliers. It then rose considerably in the second half to end the year approximately 24% up on the value at the start of the year. The business activities and result of portfoliomanagement for the year ended 31 December 2017 continued to be shaped by the establishment of the entity’s organizational structure. portfoliomanagement is not classified as a bank. However, the main regulations for credit institutions are applicable to portfoliomanagement. The requirements for a “proper business organization” are very stringent and involve corresponding expenditure. In financial year 2017, initial successes in reducing the loan portfolio were reflected in the decrease in the carrying amount of the portfolio and restructuring measures were completed. For financial year 2017, portfoliomanagement reported a negative result before loan loss allowances and provisions, and before foreign currency translation of EUR 32.9 million (previous year: EUR 29.7 million). Net interest and net commission income totaling EUR 0.6 million (previous year: EUR 0.4 million) and net other comprehensive income of EUR 0.9 million (previous year: EUR 26 thousand) were reduced by other administrative expenses of EUR 28.4 million (previous year: EUR 27.9 million) and by personnel expenses of EUR 5.9 million (previous year: EUR 2.2 million). On account of net additions to loan loss allowances and provisions of EUR 2.4 million, which were down substantially on the prior-year figure (EUR 470.1 million) and a negative result from foreign currency translation of EUR 9.1 million (previous year: EUR 5.6 million), portfoliomanagement recorded an overall net loss for the year of EUR 44.4 million (previous year: EUR 505.3 million). On the whole, business performance in 2017 was better than projected, mainly due to the fact that loan loss allowances and provisions were much lower than envisaged as a result of better market forecasts. While net interest and net commission income was lower than projected and other administrative expenses were higher than anticipated, personnel expenses were only marginally above budget. Other comprehensive income was higher than expected. In the financial year now ended, net interest and net commission income was again reduced by customers’ failure to make interest payments owing to the improved yet still very difficult conditions in the ship financing segment. Income from the non-performing commitments remained insufficient to cover all contractually agreed interest. In other administrative expenses, higher costs were recorded in particular for organizational consulting services in relation to the set-up of the entity and for unbudgeted costs for register corrections. Other comprehensive income comprises unplanned reversals of provisions and reimbursement of legal costs by customers. WHAT IS AN “EXPOSURE AT DEFAULT”, EAD? The Exposure at Default (EaD) denotes the amount of the existing loan receivables at the time a borrower defaults. A borrower is deemed to have defaulted if they have delayed the payment of interest and the repayment of capital for more than 90 days. DO FLUCTUATIONS OF THE U.S.-DOLLAR EXCHANGE RATE AFFECT THE SUCCESS OF PORTFOLIOMANAGEMENT? portfoliomanagement is not exposed to a direct currency risk, as the portfolio was acquired with a currency-matching refinancing, so that there are no open foreign exchange positions in the long term. A large portion of the ship loans administered are denominated in U.S. dollars and reported in euros. A rise in the value of the dollar will thus increase the reported outstanding receivables volume. By analogy, a fall in the value of the dollar will reduce the receivables volume. HAS THE SCOPE OF PORTFOLIO TRANSFER BEEN FULLY UTILIZED BY HAMBURG COMMERCIAL BANK (FORMERLY HSH NORDBANK AG)? Hamburg Commercial Bank (formerly HSH Nordbank AG) has so far not fully utilized the scope for portfolio transfer granted by the European commission. At a later time, a further sub-portfolio with a receivables volume of up to about 1.2 billion euros (in terms of the EAD as at 31 December 2015) could be acquired. The market value of this additional portfolio would then have to be determined separately, as the transfer values determined by the European Commission ceased to be relevant on 1 September 2016. HOW WAS THE MARKET VALUE OF THE PORTFOLIO DETERMINED? From the point of view of budgetary law, the states of Schleswig-Holstein and Hamburg engaged their own auditor.To verify whether the market value of the loan portfolio as at 30 June 2016 on the basis of the documents provided by Hamburg Commercial Bank (formerly HSH Nordbank AG) reached at least the figure of EUR 2,426,724,041.42 which resulted from the figures determined by the European Commission. On 30 June 2016, the auditor reported: “According to our assessment on the basis of the findings of our audit, the market value of the credit portfolio as at 30 June 2016, based on the documents provided to us in the Hamburg Commercial Bank (formerly HSH Nordbank AG) data room, amounts to at least the value of Euro 2,426,724,041.42 which resulted from the figures determined by the European Commission.” The transaction was thus lawful from both the State Aid and budgetary law points of view. WHAT IS A FEEDER / FEEDER-MAX CONTAINER VESSEL? Feeder and feeder-max are smaller vessels serving as feeder and distributor of containers and cars for large seagoing ships and seaports, where the routes are not navigable or are uneconomical for large ships. WHAT IS A HANDY / HANDY-MAX CONTAINER VESSEL? Handy and handy-max are smaller container vessels with shallow draught. They are suitable for smaller ports that cannot be called at by larger container vessels. WHAT IS A PANAMAX / SUB-PANAMAX- CONTAINER VESSEL? Sub-Panamax and Panamax are medium-sized container vessels which were already able to travel through the Panama Canal prior to its widening. Post-Panamax and Super-Post-Panamax make up the second largest container vessel category for the transport of large volumes of containers and can call at only a few large ports.